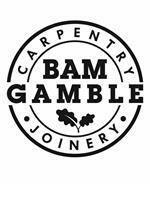 Bam Gamble Carpentry and Joinery - Carpenter based in Fordingbridge, Hampshire. Bam Gamble Carpentry and Joinery prides itself on offering a friendly, reliable and professional service. I have been a carpenter for over 25 years and offer quality workmanship at realistic prices. I cover all aspects of carpentry work as well as kitchen fitting and handmade bedroom furniture. Please feel free to contact me on the above details, either by phone, text or email, whichever method you prefer, where I will be more than happy to help.